You Will Also Recieve A Free Copy Of Agostini's Latest Book ''My Friend Ago'' Limited Numbers Of The Book Available. Order now and you maybe lucky to recieve a signed copy. This Is An Exclusive Offer Only Available At TheVisorShop. 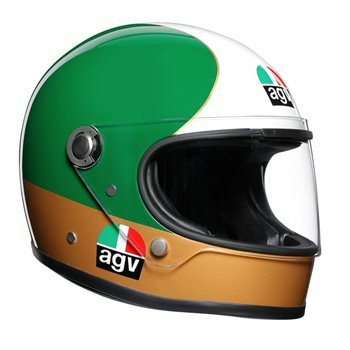 AGV have released a new line of retro-inspired helmets, celebrating 70 years of the Italian manufacturer.The new X3000 is a reproduction of the helmet worn by multiple World Champion, Giacomo Agostini in the 1960s and offers all the modern safety features you would come to expect from an AGV helmet, whilst retaining the authentic style of the original design. The iconic model that gave birth to the AGV logo The X3000 Carries Agostini's signature and includes the contoured chin piece just as he liked it so that he could lean right up against the gas tank. The tricolour Agostini helmet, seen from behind, just as his rival saw it. The X3000 Ago has the same colourway, same leather bag used for transport but with all the modern technology and safety. Only 2000 have been made to celebrate this limited piece. The venting has also been hidden within the large visor, to prevent compromising the classic look. The X3000 has been built to the same shell volume as Ago’s original helmet and comes available in three shell sizes. Designed to offer a snug fit around the wearer’s head, the new helmet comes with an embroidered logo within the interior and there’s a neat internal pocket to house the external rubber vent cover, to prevent loss. Each helmet also ships with an authentic carry bag, with the Agostini edition made of real leather and the rest of a synthetic material. Visor on off air vent with channels hollowed in the shell.